Three weeks after a goalless first leg in France, Barcelona stormed to a 5–1 victory against a Lyon side that left it too late to truly contest the course of the game. Barcelona looked to instil their usual dominance of possession in the Camp Nou from the outset. Piqué, Lenglet & Busquets were left against the trio of Fakir, Dembélé and Depay on a man for man basis, while the rest of the side pressured the ball high up the pitch in a bid to win back possession. Despite this, the defensive trio of Barcelona dropped very deep, presumably to combat the threat of Dembélé and Depay’s pace. This left a huge chasm in midfield not exploited by Lyon, who didn’t show enough intent to play through the space. 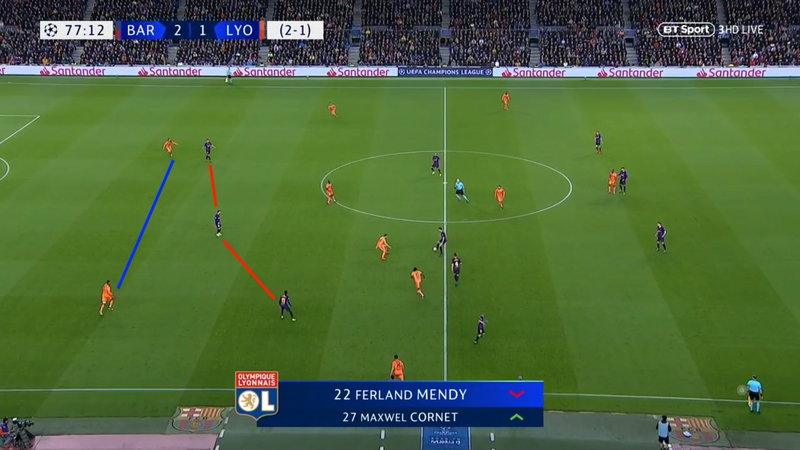 Barca’s confidence to get high and tight on wingbacks Dubois and Mendy closed off the most familiar and safest passing lane for the Lyon centre backs. In combination with the aggressive pressing, Lyon’s backline was forced consistently to make longer passes with a lower probability of success. Lyon found it very difficult to mount meaningful attacks in the first half, with their best chance in the period coming on the counter. Mendy drove into space down the left and pulled it back for Dembélé, who blasted his shot over the bar. Barcelona maintained comfortable possession of the ball and were able to move it into Lyon’s final third without great resistance. 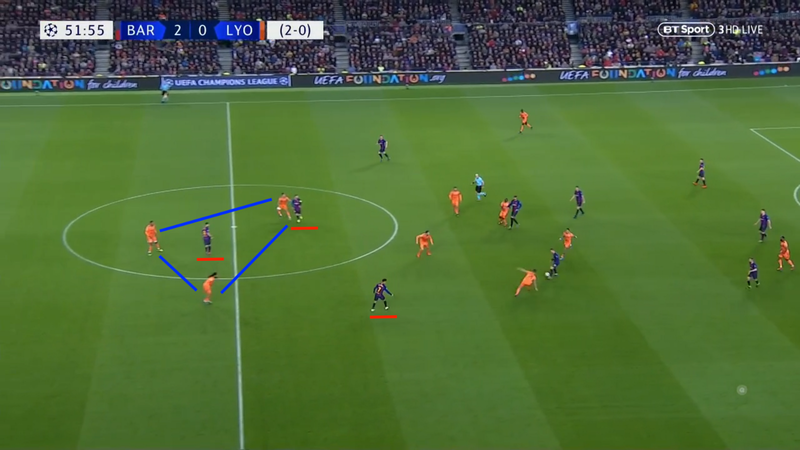 Coutinho and Messi lingered threateningly in the half space between centre-back and wing-back, pinning Lyon into a back five and ensuring a numerical superiority in the middle of the pitch. Despite their lack of pressing, Lyon’s defensive line didn’t retreat too far deep. 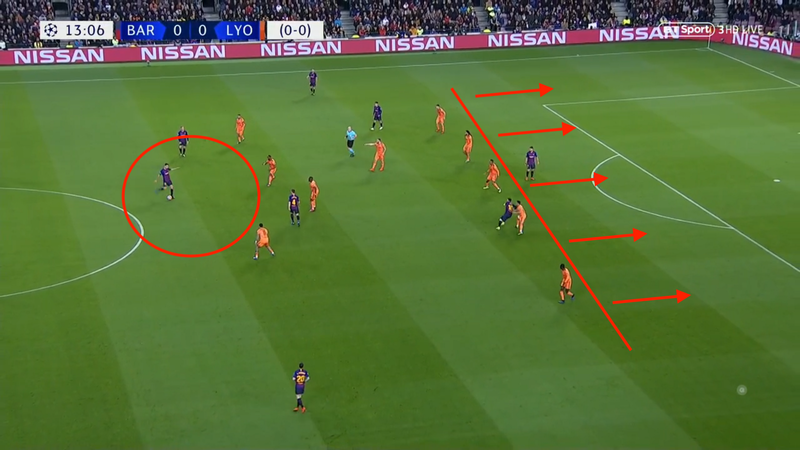 Given the combination of space in behind, and time afforded to the Barcelona midfield on the ball, the opportunity was there for multiple attempts to clip the ball over the top for either Suarez or Coutinho to run on to. As usual, the focus of Barcelona’s attacks came down the left hand side of the pitch. With Coutinho pinning Dubois back to the deepest defensive line, Alba had bundles of time and space and was a constant outlet for advancement of the ball. Messi and Suarez took it in turns to drift over to create an overload. Barcelona led 2–0 at the break after a fantastic Messi panenka penalty kick, preceding some moments of brilliance from Arthur and Suarez which gave Coutinho a tap-in. With Lyon needing at least two goals to rescue the tie, drastic changes were needed at the break to try to change the course of the game. From the outset of the second half, it was obvious that Lyon’s wingbacks had been instructed to move much higher up the pitch. 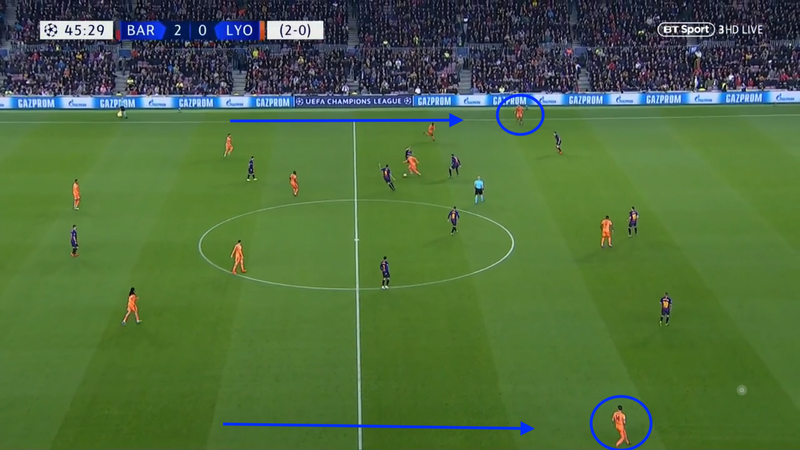 This allowed Lyon to involve another man in the middle of the park, which let them compete for possession of the ball a lot better than before. This worked tremendously based on the numbers. Lyon went from 37% possession in the first half, to 53% in the second. Although Barcelona may have been looking to be a little more pragmatic as the game went on, majority possession for an opponent in the Camp Nou is impressive in any context. However, the price they paid for seeing more of the ball was less security against the Barca front three. Quite commonly the centre-backs were left with no man spare against Messi, Suarez and Coutinho. A dangerous scenario for any defence in world football. 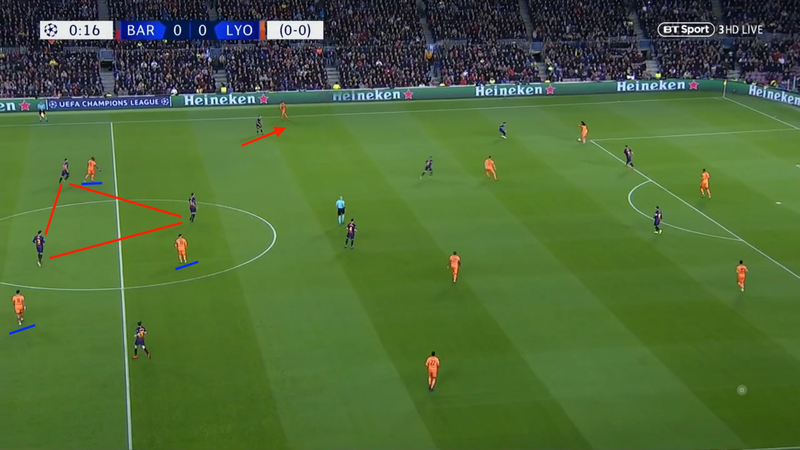 Adding to this, Lyon’s defensive line was shifted 10 to 15 yards higher up the pitch, in conjunction with more aggressive pressing. They started to press even Piqué & Lenglet, which was a massive shift considering Busquets, Arthur & Rakitić, all in more advanced roles, weren’t feeling the press too much in the first period. Lyon pulled a goal back from a set piece, with Tousart finishing smartly, and generally looked brighter for playing with more conviction. For the first time in the game, Barcelona weren’t looking fully in charge of proceedings. With around twenty minutes left, both Valverde and Genesio made their remaining substitutions as Lyon chased the equaliser, and Barcelona looked to put the tie to bed. Mendy was withdrawn for Cornet, and the quiet Depay made way for Traoré in a plan to provide more width. Ousmane Dembélé was introduced at the expense of Coutinho, who gave them a more direct threat on the counter attack. Vidal replaced Arthur and Semedo came on for Sergi Roberto. The tie was effectively ended just moments later, with Lyon inexplicably overcommitting men forward in a gung-ho fashion. With just Denayer and Marcelo covering, Lyon lost possession in the middle of the park and Messi’s trickery and calm finish put the tie to bed. With the tie out of reach, Lyon subsequently collapsed allowing Piqué and Dembélé to extend Barcelona’s lead to 5–1 over the next ten minutes. Lyon had a very promising period after the break where they dominated possession and pulled a goal back, but the spells either side of that were not managed optimally. They handed Barcelona too much respect and time to play in the first half, and were too aggressive too quickly in pursuit of the equaliser. Barcelona advance to the Quarter Finals, and will be looking to make amends for their nightmare from last year at this stage of the competition, when they were dumped out by Roma in the Stadio Olimpico. This year, they must be considered frontrunners alongside Juventus, Man City & Liverpool.